The results from the 2007 Usability Professionals Assoc. 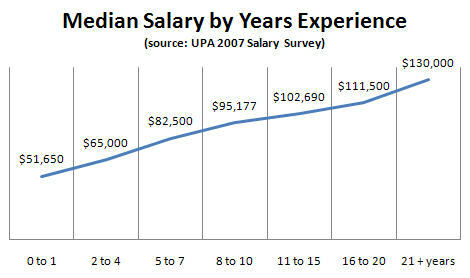 salary survey are now available to UPA members. I am one, so I'm posting some highlights plus some new charts I made from their numeric data. Sadly, I can't get the raw data to try anything very interesting. A caveat first: The "usability" profession is only a sample of the jobs that relate to interface design, customer experience, interaction design, and other related titles. The survey reflects this (as you'll see) but does not necessarily reach all related disciplines. I'm particularly suspicious of the low numbers who responded from the US west coast, and suspect this is to do with general organizational regional politics (who belongs to what, who reads what, who cares). California in particular might bring up some of the numbers, from what I know of their salaries and consulting rates. In general, salaries have gone up since 2005 by about $5000, most markedly outside the US (UK and Canada) and for women (who are, however, still paid less than men). Consider me irate that women aren't as valuable as men in most organizations, for most jobs, except secretarial. 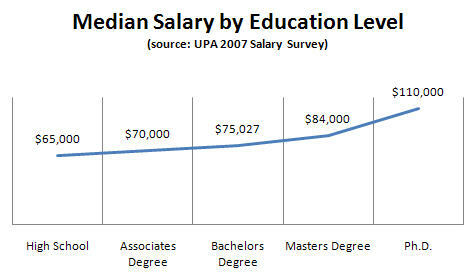 Some charts: there are linear relationships between salary and experience and salary and education level. There are interesting relationships between job title and salary. "Directorial" are the highest job bin reported, which is disappointing (in that I keep hoping there will be C-level design folks soon). 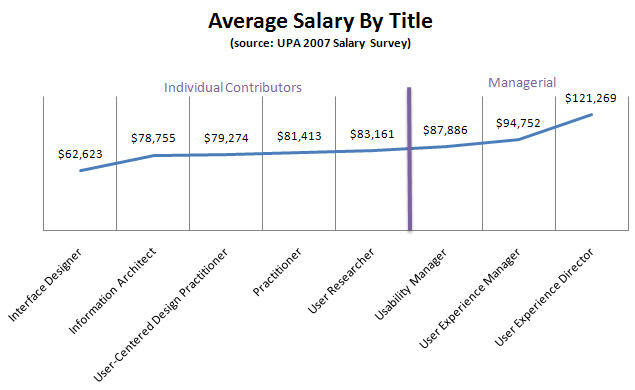 "User Research" titles are the highest paid individual contributors. This makes sense to me if UR jobs are being filled by advanced degrees. I feel they should be -- statistics, experimental design, ethnography, strategic input -- these are not activities to hire a junior usability testing person to perform. And I think the software industry understands this more and more, based on the job ads I see. Note that "usability" as a title component is now outpaid by "user experience." There were more respondents with the title "user experience practitioner" than for any other job title. This is good news, and appropriate; if a company understands that there is more to a good user experience than making it usable, then there is more involved in the job description and hiring criteria and it's also worth more. We're moving forward! (Even if women still lag behind.) Related to this, I'm personally interested in the chart of job "activities" practiced by the survey respondents. 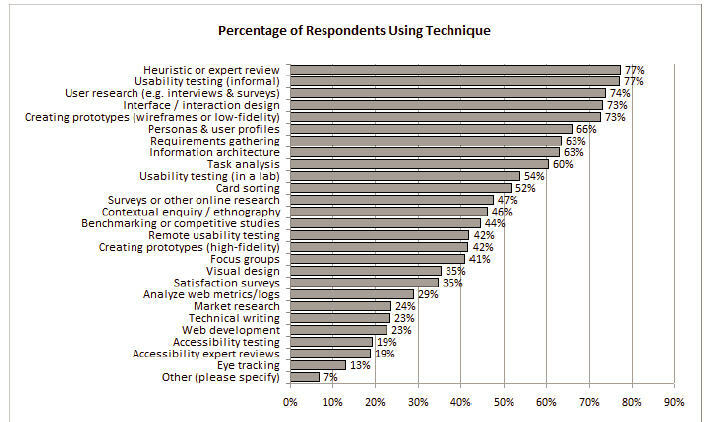 Usability testing is still way up there in frequency of mention in this surveyed pool, despite the shift in job titles. Design prototyping is close, but not at a par yet. I'm sorry to see this, since I don't think design should be done by non-designers and I don't think UX folks should be evaluating design produced by non-designers. I'm disappointed by how low quantitative activities and market research fall, but I assume this will pick up some steam as more senior quantitative user research folks are employed by UX departments. I'm especially disappointed by how low "requirements gathering" falls -- this being the number 1 cause of poor quality downstream, as found by many studies of root causes of software defects. For a change of topic: In a sobering news story for those of us still trying to get design taken seriously as a strategic role, IT development salaries are projected to soar in the next year, well above what the data in the UPA survey shows. Read about it here.